The Icelandic state is considering a ban on child circumcision—with predictable reactions. Secular humanists claim victory while religious groups claim persecution. Yet their very reaction only reinforces the straw-man view of faith as something both absurd and sinister. Like Kierkegaard’s lunatic—who reminds every passerby that the world is round—New Atheists ridicule the notion that a supreme consciousness could be connected to such a practice. And so the bifurcation grows between what people of faith understand religion to mean, and what their opponents understand it to mean. “Religion,” wrote U.S. churchman Eugene Peterson, “is like the bark on a tree. It is dead: yet it protects something living.” He reveals that external attributes of religion are not an end in themselves; they are merely the props toward internal transformation. Yet because modern society chooses only to see the externalities, it discounts the transformation. This view—ironically—mirrors the iconoclastic reforming movements of the past, which also caricatured ritual as an end, not a means. Some denominations hurry to agree, stripping away the bark of their religious practice in the hope that the sap will rise unaided. Yet rewriting your own rule book is a dangerous business. Historical religious practice creates both intellectual discipline—reminding adherents they are the equals, not the superiors, of past generations—and the practical discipline of following a rule. Such means provide the vessel for personal transformation, the effects of which eventually overflow into the world. This view of religion—as a meme that provides successive generations with the opportunity for individual change—is distinct from a supernatural or intercessory understanding. Its distinctness lies in the fact that, being existential and evidential, it is irrefutable. 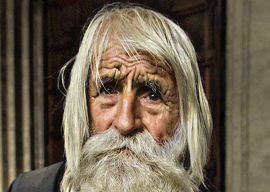 The change that took place in Elder Dobrev—a Bulgarian ascetic who died last month at the age of 100—is not open to question from humanists. And yet the existential transformation wrought in him was undoubtedly aided by supernatural belief; indeed probably rested on such belief. What then is the relationship between the metaphysical elements of religion and its tangible results? The first is openness. We have enough to address in life not to be hindered by thoughts of our mortality. Accepting at least the possibility of life after death frees us to act in the world. As G.K. Chesterton wrote, we can only understand everything with the aid of what we don’t understand. Rather than creating paralysis, accepting the limits of our knowledge releases us from it. The second role is metaphorical. Metaphysical concepts such as eternal life and eternal death can be read into the world around us. The tortured face of a meth addict reveals a living hell; the beatific expression of Lindsay Lou singing about the River Jordan, a living heaven. Even the great religious metaphor of rebirth can be found in the quotidian. Someone of faith is reborn not once but every day, shedding the encrustations of the past and embracing the present. The third is scientific. In his new book Science and Spiritual Practices, British biologist Dr. Rupert Sheldrake has examined the neurological and sociological dividends of a variety of religious practices. Prayer, gratitude, ritual, and unison singing: All lead to better brain functioning as well as better social cohesion. There couldn’t be a stronger indication that religion leads to personal transformation—and that such transformation has helped drive our evolution as a species. How can this transformation be characterized? First, it contextualizes our individual consciousness within the race as a whole. As conscious beings, we are endowed with creativity. When this creativity goes too far, we seek to impose our consciousness—or ego—without restraint. The extreme example is the total transformation imposed by Communism and Fascism. By failing to acknowledge any higher authority, their progenitors sought to become God—with disastrous results. Yet true religion also guards us against the opposite extreme of fatalism, which remains unacceptable to the demands of both conscience and self-realization. We find a balance within the unitary worldview of faith, learning to exercise our creativity within safe limits. We similarly learn to mitigate our competitiveness, finding natural limits to our individualism as well as our authoritarianism.